A null (which goes by various names depending on the software: After Effects calls them nulls, 3DS Max calls them Helpers, Toon Boom calls them Pegs) is a type of layer used solely for the purpose of parenting another layer or effect. A null layer itself has no properties and is entirely transparent, but can be used to reposition a layer, act as a mass parent to a series of layers which need the same manipulation, or as a marker for a motion tracked camera. A tool from traditional animation which has carried across to many 2D animation packages, onion skinning offers a semi-transparent preview of the surrounding frames as a reference for drawing the current frame. This allows the animator to more effectively estimate correct spacing of motion and keep character details consistent from frame-to-frame. Puppet tools appear in a number of modern 2D animation programs, and act similar to 3D rigging wherein invisible ‘bones’ are set up to control the movement of different parts of a character or object. While 2D animation may alternately rely on frame-by-frame animation not requiring a puppet rig, or a mixture of puppet and frame-by-frame, a 3D character generally cannot be fully animated without first being rigged. Differing from the regular workspace playback feature which is prone to lagging with larger files, the ‘Preview’ function renders a version of the animation for real-time, loopable playback. This allows for a more accurate representation of the final animation’s timing. The Preview function generally offers its own set of playback controls and settings, allowing for adjustments in resolution and frame rate to achieve a quicker playback. Resolution settings refer to the size, and quality in relation to size, of a video or image. Size dimensions are measured in pixels (for example 1920px by 1080px, known as 1080p, a standard 16:9 format) and should be selected in accordance with the final size requirements of an animation (or larger, then scaled down). Quality resolution settings are measured in pixels per inch (PPI), and refer to the amount of pixel data available for each given inch of the image. Higher PPIs result in larger file sizes, but can be used for more applications (75PPI is the minimum standard for screens, while 300PPI is the minimum standard for high quality printing). Finally, many animation and effects programs allow resolution settings to be non-destructively adjusted in the workspace (see W: Workspace) to allow for faster preview rendering while working on the file. Preview resolution is measured in relation to the actual file resolution (full, half, third, quarter). In general live-action narrative film, a ‘shot’ is the word used to describe a single camera take, from cut to cut, and a ‘scene’ is used to describe a series of shots taking place within a single location or time within the story. However, the traditional terms in animated productions differ slightly: a ‘shot’ as described above is called a ‘scene’, and a ‘scene’ is called a ‘sequence’. Due to the proliferation of live-action terms, modern production houses can differ from place to place on their usual choice of terminology. If you find yourself discussing a ‘scene’ with an animator, it doesn’t hurt to clarify which is their preferred use of the word. The timeline is the visual layout of layers and frames in animation software. It generally takes the form of an elongated table with layers in rows and frames spreading across time in columns. Individual frames are illustrated with visual markers, usually displaying the length of exposure for each frame with a line or extended rectangle. Computer-generated keyframes are also marked distinctively, depending on the individual software. Matte options are available upon export of particular filetypes (see J: JPEG Sequence), and refer to whether or not the image holds transparency information. When an image is saved with a matte, it places a plain colour background (usually black or white) onto any currently transparent pixels. Conversely, a straight (unmatted) file retains the transparency as it is in the working file. Unmatted files must be saved with an alpha channel (see A: Alpha Channel and C: Colour Depth). As one might suspect, the workspace is the layout of the drawing stage, tools, and various timelines while working on the animation. 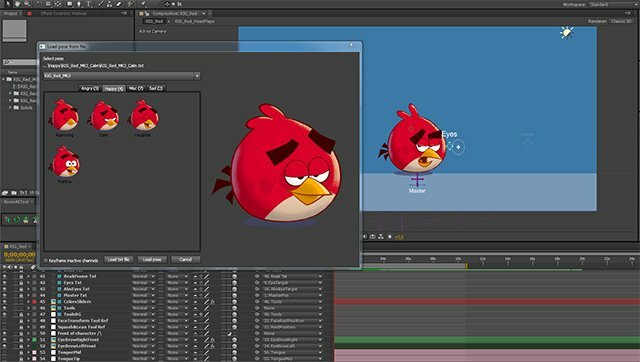 Most modern animation software has a customisable workspace with dock-able and removable toolbars. Many also offer the ability to switch between different ways of viewing frames, such as the timeline view, Xsheet and graph editor (see T: Timeline, X: Xsheet and G: Graph Editor), depending on the current animation needs. Similarly to a timeline (see T: Timeline), an Xsheet is a table used to layout the sequence and timing of animated frames. Xsheets show layers in columns and frame exposure in rows, with frame numbers (or letters for mouth shapes) marked for each length of exposure. For this reason Xsheets were a staple of pre-digital animation, as they visually depicted the timing of marked frames before the animation phase began, allowing for more efficient planning of timing. Certain modern animation programs contain a digital version of the Xsheet, which can be used instead of, or in conjunction with, the Timeline. An animator’s best friend, a zip file is a type of compression technology where multiple files and folders may be crammed into a singular file which is often of a smaller file size than the original separate files. Very handy for emailing or transferring large image sequences which would otherwise need to be send individually.